Quitting a cow is one of those crucial decisions you make at the spur of the moment when you show in cutting or in herd work classes. This article is about helping you make good decisions about when it’s time to decide if you should quit … or not. But first, here are a few generalities regarding “good, mediocre and bad” cattle. If your cow is “good” has she been maximized … that is, did you get all the credit-earning work out of her yet? 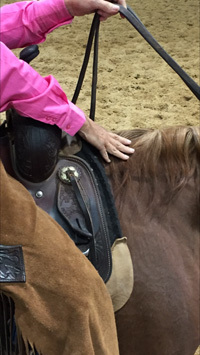 A good cow faces your horse and goes back and forth for 15-30 feet at a medium speed in the middle of the arena. She has “feel” which means she stops and goes the other direction when you get into the correct position to stop her. The ideal cow never darts toward the turn back people, the herd holders, the back fence or the side walls of the arena. If your cow is “mediocre,” is she worth staying on for what you need to accomplish in your run as a whole? Typically this kind of cow wanders around a lot or stays out away from you. She’s not that interested in you and your horse or even interested in getting back to the herd. She also might move at a rather slow speed so she doesn’t give you a chance to earn credit. She’s “safe” but not not run building. If your cow is “bad,” is the only smart thing to do quit and get another cow? This could be a cow that doesn’t move, doesn’t respect your horse or who runs all over the arena. Normally, you need to quit that kind of cow immediately. Here are eight reasons to consider quitting a cow. 1.) She starts off well, but then darts hard towards one of the corners. The key word here is darts. You can bet that the next time she comes back in the same direction, she will try even harder to get to the corner and/or return to the herd. That cow is no good. Do your best to stop her and quit working her as soon as possible. She stands there and your turn back helpers are yelling and slapping their chaps. She barely moves. Quit. Her tail goes up and maybe over her back. She is on a mission to go anywhere at jet speed and get by any horse she can. She might aim at the turn back horses or just run around wildly in the arena. If she is super wild and you keep working her, even if she’s not coming in your direction, chances are she’s going to turn on you sooner or later and come at you hard! Stop working her. 4.) She starts off like an ideal cow, but then starts moving in any direction out of the middle of the arena sweet spot. She may not be that bad, but chances are you’ve gotten all of the good stuff out of her and she’s not coming back to stage center. The choice to stay on her depending upon other factors, like how good or bad the cattle are as a group, how much time you worked your first cow, etc. 5.) She starts running from wall-to-wall. It’s time to quit. 6.) She tries to get through the turn back helpers. Thumbs down. 7.) She snorts at you! Quit ASAP. 8.) From the very beginning she has absolutely no interest in your horse. She wanders from one place to another … everywhere but in the vicinity of you and your horse. She may or may not be that “bad,” but without you and your horse being able to really affect her behavior and stop her, you won’t be able to earn a lot of credit while working her. Again, it’s your call whether to quit her or work her a little bit longer, depending on other factors. A great way to practice deciding when to quit is to watch cattle from the bleachers during other classes. As you watch, regardless of what the cutter does, decide when you think it is the best time to quit.